with fully CNC machined billet aluminum main body assembly finished in a beautiful blue anodized finish along with a high performance diaphragm assembly. These unit are great for maximizing performance on everything from a stock motor to higher output applications including supercharged models. 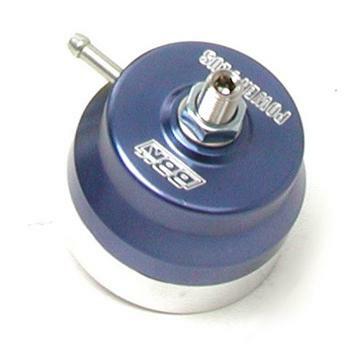 They are an easy do it yourself replacement for your factory non adjustable regulator and tuning pressure can be done in seconds on the car. We do recommend a fuel pressure gauge such our part #1617 liquid filled model as it mounts to our adjustable regulators eliminating running fuel pressure into your interior.